It was a surprise when I opened an 1884 issue of the “St. 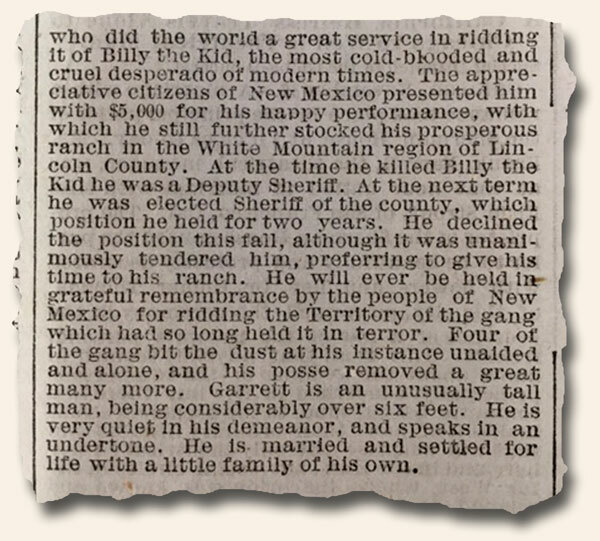 Louis Globe-Democrat“ to find a print of Pat Garrett, the noted sheriff of Lincoln County, New Mexico, who: “…did the world a great service in ridding it of Billy the Kid, the most cold-blooded and cruel desperado of modern times…” as the article notes. 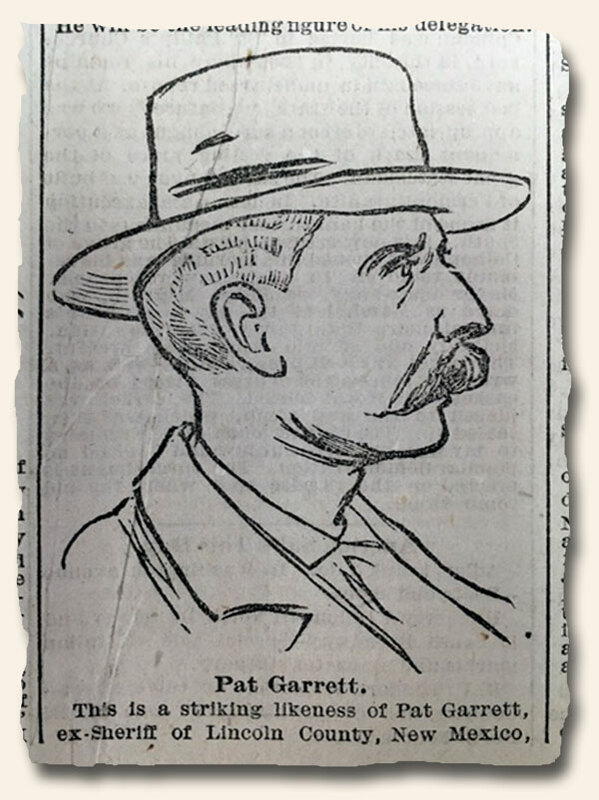 Never before have I seen a print of Garrett in any periodical. Is anyone aware of an earlier print, or any print of him from any date? 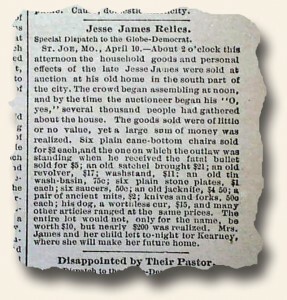 This issue is from over 3 years after he killed Billy the Kid, his likeness appearing in the newspaper because he attended a convention of cattlemen held in St. Louis at this time. They should have published why the first time he was killed it didn’t work. Perhaps one of Gilligan’s ancestors… What does it mean? 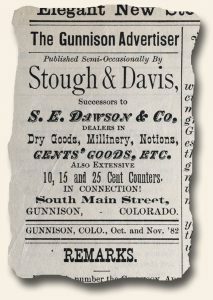 An issue of “The Gunnison Advertiser” from Colorado, 1882, notes that it is: “Published Semi-Occasionally…”. Just what does this mean? If “occasionally” means it is not on any set schedule–printed at the whim of the publisher–how much more defining is “semi-occasionally”? Few eras of American history have been romanticized as the Post-Civil War 19th Century. For those who grew up in the 1950’s & 1960’s, television had more than its fair share of Western-themed shows. And the “Wild West” was a common feature on the silver screen as well. 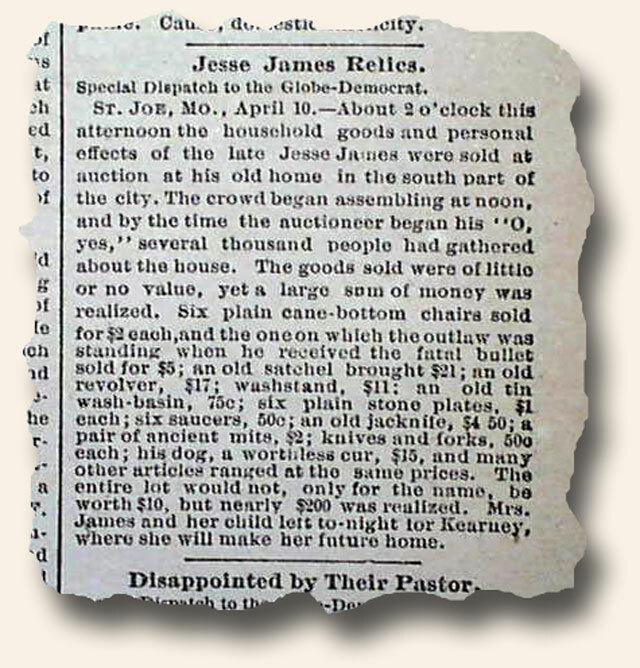 Not only can one capture a flavor of that time when the American frontier was pushing further West, but actual historical events can be read as captured in newspapers of the day, when the events happened. 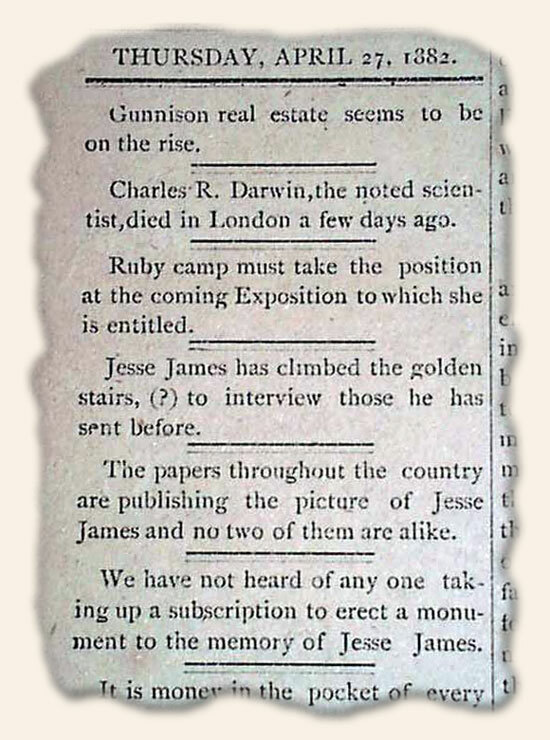 This is the intrigue of collecting rare and historic newspapers. From the moment the Civil War ended, the national focus was on the lands west of the Mississippi. 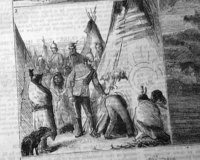 It was common to find reports, even in newspapers from the big cities of the East, of skirmishes with Indians on the Great Plains and elsewhere. The Custer Massacre perhaps ranking as the most notable, but reports can be found on the Battle of Wounded Knee, Captain Jack and the Modoc Indian War, reports of Geronimo, Sitting Bull, the Apaches and others. Newspapers are a great resource for those wishing to explore/collect Native American history. And what about Outlaws & Gunfights? 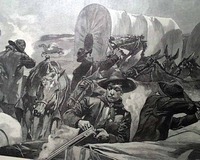 Stage coach robbery reports are not an uncommonly found in newspapers from the 1870’s and 1880’s, and train robberies and bank robberies could be found scattered throughout newspapers of this period as well. 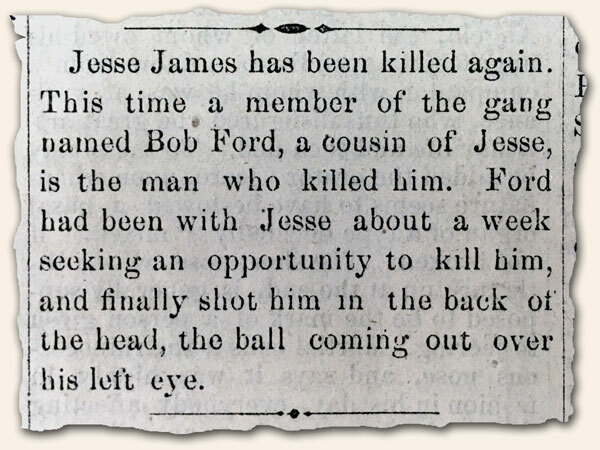 It was a time when some of the more famous—and infamous–names of American history could be found in newspapers, including Jesse James and his gang, Billy the Kid, Wyatt Earp (yes, there are newspaper reports of the Gunfight at the O.K. Corral), the Dalton Gang, Younger brothers, Robert Ford, Buffalo Bill, Jim Bridger, Vasquez, Doc Holliday, Kit Carson, Lizzie Borden, and on and on. Although “Jack the Ripper” was a name from London crime history his deeds made headlines on this side of the Atlantic as well. Reports of their deeds are not fictionalized; they are the events as reported in newspaper accounts of the day. 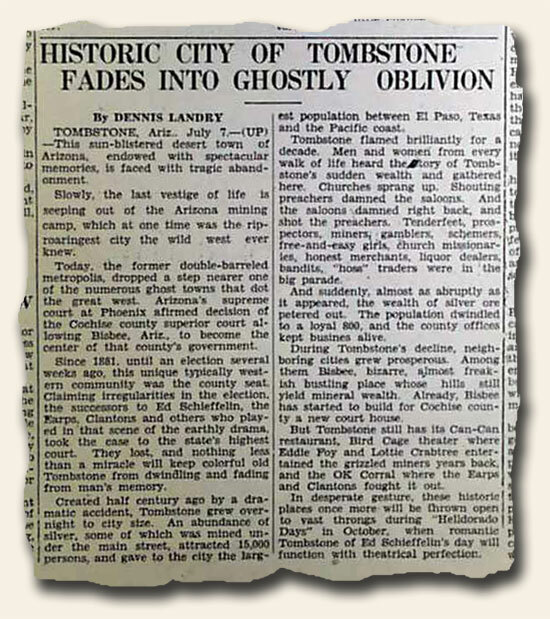 Some the famous towns of the Old West had their own newspapers and can be purchased for anyone’s collection, including titles from Tombstone, Leavenworth, Deadwood, Tucson, Reno, San Francisco, Leadville, Carson City, Denver, Salt Lake City, and many more. Although crime reports were common, there is so much more in newspapers from this era. Politics certainly found their way into newspapers on a daily basis. Ulysses S. Grant and James Garfield were perhaps the most notable Presidents of the era, and reports on the latter’s assassination are commonly found. Science and innovation were the focus of the famous title “Scientific American” which began in 1845 and still publishes today. Within its pages were many reports on Thomas Edison, Alexander Graham Bell and their inventive work, plus illustrations of the creations of many of the devices and improvements we still enjoy today. Many were first unveiled in Philadelphia’s Centennial Exposition of 1876 and the Columbian Exposition at Chicago in 1893. It was a time when Brigham Young and the Mormons were venturing west, ultimately to settle in the Salt Lake City Valley. P.T. 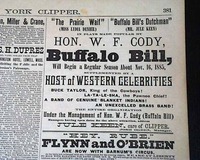 Barnum was making news with his circus, and Frederick Douglass & Booker T. Washington were coming to national prominence as spokesmen for the newly emancipated slaves. The Chicago Fire & the Johnstown Flood were but two disasters which changed the American landscape and graphic accounts were more brutal in the 19th century then they are today. As is the case with present-day newspapers, sporting reports were typically found, with baseball, football, tennis and golf gaining widespread popularity as diversions for not just the wealthy but for everyone. As you see the post-Civil War era was very rich in history. And I only touched on a few of the highlights. Newspapers of the era reported not just the events & names we know of through history books, but captured the mundane events of daily existence which provide a fascinating flavor of life in America when the wealth & prestige of the United States was emerging upon the world landscape. A world awaits the collector who delves into this fascinating era of American history. We have many issues of the “Weekly Galt Gazette“, California, in our Old West inventory, but perhaps few of our collectors know this city–current population of some 23,000, in Sacramento County–had its start in the California Gold Rush. In 1850, a group of farmers settled around the banks of a small stream, Dry Creek, close to Galt. Their plans were to grow beef and dairy products. In the year 1869, the town of Galt was laid out by the Western Pacific Railroad Company. The name Galt was given at the request of John McFarland, a local rancher, in honor of his home town in Canada. It was previously called Dry Creek Township after the stream by which they settled. By 1869, the community consisted of blacksmiths, dairymen and cattle ranchers. Raising cattle was the main occupation. Galt was built almost entirely of wooden structures making fires the biggest problem for the town. However, many of the old original homes are still standing, in excellent preservation, around town. In 1880, Galt had two general merchandise stores, one variety store, one hotel, one harness shop, two blacksmith shops, two wagon and carriage manufacture and repair shops, one wood yard, one livery stable, two barber shops, two shoe stores, two saloons, one meat market, one barely mill, Wells Fargo & Co.’s Express Office with three physicians and one attorney-at-law in town. By the turn of the century, cattle raising and dairying gradually decreased and agriculture took over. The principal grain was wheat.